Of late, writer and lawyer, Michael Gilbert has been a lot over the blogosphere. 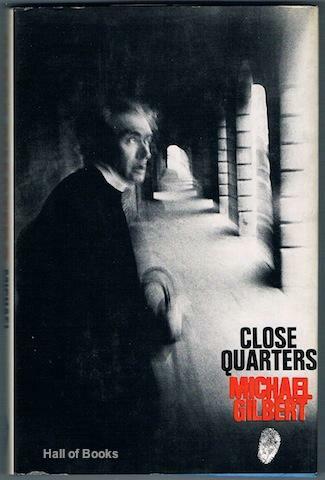 Yvette @insomanywords did a series of posts on him and then Margot Kinberg @ Confessions of a Mustery Novelist turned the spotlight on his first novel, Close Quarters. 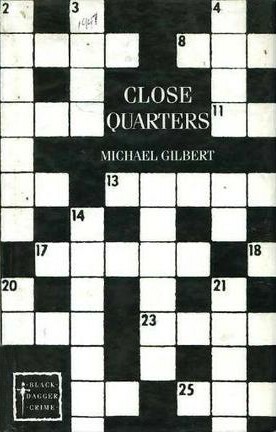 Unable to resist any longer, I borrowed Close Quarters from the Open Library and found it so engrossing that I finished it in a day. 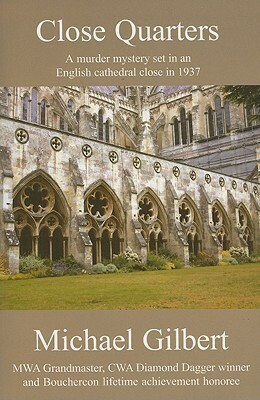 Anyway, to get back to the story, the Dean is a worried man and in a masterly first chapter - as he tosses and turns on his bed while a storm rages outside - we are told why: there is a smear campaign on against the Principal verger, Appledown which has taken the form of anonymous letters and messages which appear all over the place: on flags, walls etc; there is the accidental death of a Canon a year back; there is the widow Mrs. Judd who just wouldn't move out of the premises; there is Vicar Malthus who seems to be always disappearing; there are the small, niggling things which has made the Dean realise that there is 'something rotten in the Close'. The atmospheric first chapter sets the tone of the book which can turn downright eerie and scary at times (And since I was reading it in the dark of the night, I KNOW). Unwilling to involve the police, the Dean calls over his nephew who can conduct an unofficial investigation. However, soon after the arrival of Pollock, a murder occurs and the police does get involved in the form of Inspector Hazelrigg (who would go on to appear in six other books by Gilbert). Incidentally, I guessed the identity of the murderer through something read either in an Agatha Christe or Sherlock Holmes where it was said that it is the unexplained things, however insignificant they might appear to be that give you the clue to the whole affair. The closed community - where Masters prepare lessons in Latin and students learn Greek but where Edgar Wallace is also available as bed-time reading - adds to the tension though there is humour to be found too (as a character puts it) in "lacerating each other's characters in the most Christian way imaginable." I already have Gilbert's Smallbone Deceased, Death has Deep Roots, and Killing of Katie Steelstock on my wishlist; would you recommend any other? First Line: The Dean as he lay awake in bed that memorable Sunday night, pondered the astonishing vagaries of the weather. Submitted for Fridays Forgotten Books @ Sweet Freedom. Please head over there for the other entries. Thank you very much for the kind mention, Neeru. I'm so glad you were drawn into the book. I agree, too, that it does have some eerie moments! Thanks to you, Margot. your fine review made me borrow this immediately. I just read this recently also. I enjoyed it a lot, and Smallbone Deceased even more. I haven't reviewed either of them yet. I have not read that many books by this author but I did like Game Without Rules, a book of short stories about two spies. Thanks Tracy for the recommendations. I hope I am able to find both these books. Also would love to read your review of this book. 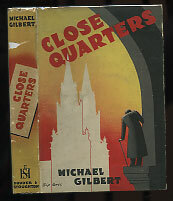 I'm going to have to pick up a Michael Gilbert or two next time I visit a bookstore or book exhibition. I rarely buy books online. Looking forward to how you find him, Prashant. Happy book searching. Margot wrote about this book this week as well, Neer. So now I'm doubly sure I'm going to get a copy. A used copy - not a Kindle one. For sure. 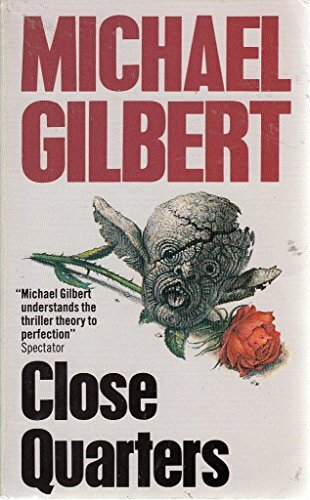 Yes, as I mentioned in my post it was your posts and finally Margot's review of Close Quarters that gave me the final push in picking up a Gilbert. This book is better read as a printed book in your hand so I am glad you are getting a physical copy. Looking forward to your take on it. I was browsing through your excellent blog.Great writing! Welcome to the blog, Sumal and thank you for your very kind words. Please keep on visiting and encouraging. Gilbert is nearly always a very god bet! Going by this book and the excellent reviews that I have read of his books, Sergio, he certainly seems so. I'll definitely be reading more of him.